As thermometer-busting temperatures climb day into night, it's no exaggeration to call desert summers extreme. Adding insult to injury for red wine lovers is the thought of months in white-wine-and-rosé exile. Instead, take these tips for choosing summer reds to help keep cool at the dining table or poolside get-together. Mmm, a beautifully charred steak with a tasty, tannic Cabernet Sauvignon. While that combo is a food match made in heaven in cooler weather, it's hardly so during the Hades heat of summer. As much as beefy proteins mute Cabernet's mouth-puckering tannins, a drying mouthfeel is downright unpleasant in parched, hot weather. Save the Nebbiolo and age-worthy Cabs for autumn. Now's the time to switch gears and seek out lower-tannin reds instead. Think Pinot Noir, Dolcetto, Barbera, Valpolicella, Loire Cabernet Franc, Beaujolais, fruitier Merlot, Syrah and many Côte-du-Rhône blends. Still miss your Cab? Try cooler-climate Australian Cabernets that offer bold and juicy fruit with tannins that are less harsh. The fun-loving group at last night's food-and-wine tasting at Cooking with Class enjoyed the Four Sisters Cabernet from Central Victoria. Its currant and blackberry fruit laced with a hint of mint was lip-smacking delish, with not a dry mouth in the house. 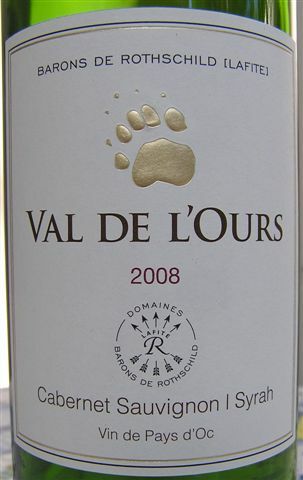 Similarly, at last month's summer wine dinner, the popular closer from half a world away was the Val de L'Ours 2008 by Domaines Barons de Rothschild (Lafite). The famed house of Bordeaux purchased an abandoned estate in the Languedoc-Rousillon region of southern France in 1999, now replanted with many of the traditional Corbières grapes. This 75% Cabernet, 25% Syrah blend is vinified in traditional Bordeaux style yet approachable now, with aromas of anise, spice and dark berries and rounder tannins on the palate. Ripe flavors of plum, currants and dark cherry ride out with a peppery kick on the finish. Try this palate pleaser with steaks, barbecue, pizza and spicy pastas. Stay ahead of the heavy, sinking feeling that comes with oppressive heat by choosing foods – and wines – that are lighter in weight, both in terms of body and alcohol content. Medium-bodied Pinot Noir does double-duty as a favorite low-tannin choice to make it ideal for a range of lighter summer food preparations. Pinot Noir goes especially well with foods that don't take well to tannins, as in lighter meats such as pork, veal and chicken, as well as most fish. At our summer wine tasting, we served 2009 Pinot Noir by Block Nine, a winery expressly created in response to an American market pining for Pinot. The medium-bodied Pinot by this small California producer clocks in at only 13.5% alcohol. 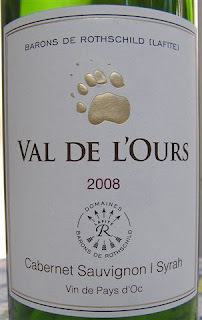 On the nose, it is fragrant with violets, strawberries and dark cherries. Silky on the palate, the wine sends out cherry and cola flavors layered with a touch of earthiness and sandalwood. You'll want to bring on the mushroom, savory and woodsy dishes for this one, perhaps a cherry-sauced pork or fisherman's-style grilled salmon. The Dashwood 2009 Pinot Noir savored at last night's tasting event hails from Marlborough, New Zealand, a site better known for Sauvignon Blanc and home to more than half of the country's vineyards. The Dashwood blend of Pinot lots from two Marlborough valleys is light on its feet, with bright cherry fruit, crisp minerality and gentle tannins. It made a tasty match for Chef Andie's potato-crusted salmon with pomegranate beurre rouge and 'cousotto,' her risotto-styled couscous creation with basil and goat cheese. So go ahead and lighten up your red wine palate this summer. You won't miss the mouth-coating heaviness of fuller-bodied wines in stifling heat while you'll still enjoy a range of seductive aromas, delectable flavor profiles and the layered complexity red wine lovers adore. And, at less than $20 a bottle for these winners, you'll stay within your summer budget as well. The school's July food-and-wine tasting falls on Friday, the 22nd. See the online calendar, make your reservations or call for event information and wine availability: 760.777.1161.